Seattle Bootie Seattle – Holiday Party! Bootie Seattle takes over Neumos on a special SATURDAY night for a very special Holiday Party! 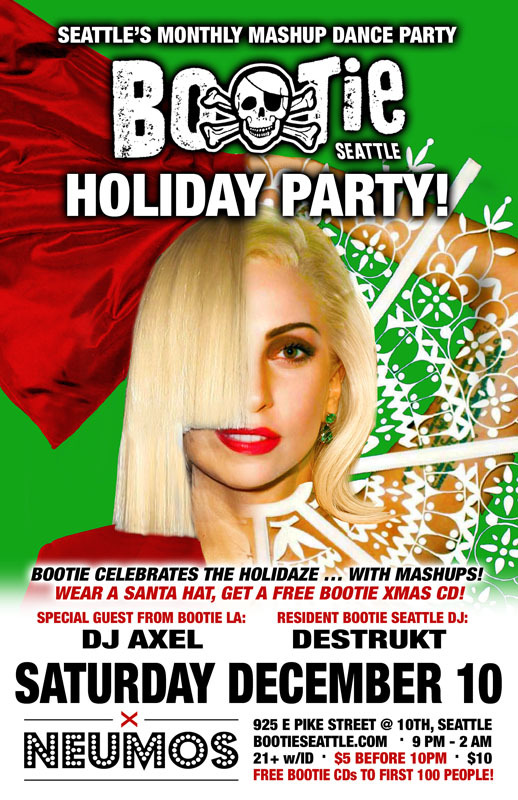 DJ Axel is taking the first reindeer up from Bootie LA to join Bootie Seattle resident DJ Destrukt as they help you get though the holidaze with the best mashups in the world. They’ll even sprinkle in a few Santastic holiday mashups, ensuring a night is filled with Christmash joy and lots of dancing! Plus, anyone wearing a Santa hat will receive a FREE “A Very Bootie Christmas” CD!